Developers building more than 50 homes in the city centre should be exempt from paying contributions to the council for two years to boost the number of people in the area, a new report has recommended. One of the key planks of the ambitious 25-year city centre masterplan is attracting more residents to live on central streets. Large-scale building projects are already underway around the city, including the 342-bed student Triple Kirks development, while others have been proposed such as the regeneration of Queens Square. Developers generally pay money towards improving areas they are building in or pay for infrastructure improvements such as footpaths and bridges. But a new report, commissioned by the city council and prepared by property experts Savills, advises that a two-year “moratorium” is put in place for any firm building more than 50 homes in the middle of city. It is also recommended that council officers consult with landlords to identify potential vacant buildings that can be developed into properties for people to live in. There are currently about 16,500 residents living in the central area with the council’s stated aim to attract at least another 3,000 people. Adrian Watson, chief executive of city centre business body Aberdeen Inspired, said: “We still have a fine array of bricks and mortar retail in our city centre and our occupancy rates stand up well compared to many others. 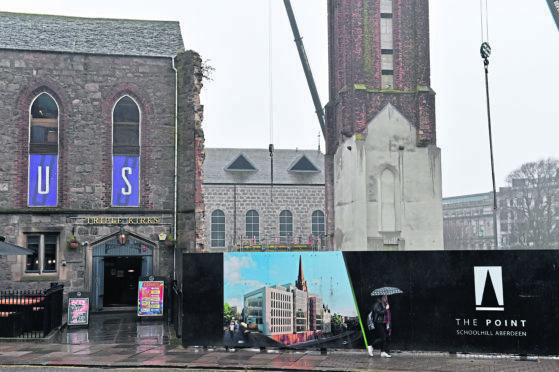 But opposition SNP city growth spokesman Alex Nicoll said: “I’m astonished – we’ve waited months for this report and the grand conclusion is that the public purse should effectively be raided to benefit private developers.